Here’s what people don’t see. Going to that Broadway show, or Comic Con, or even a movie, requires major preparation in the form of lots of rest as well as recovery time. While the rest of the world goes about their regular weekends, I sacrifice at least one day to the altar of lupus rest and recovery. It’s not glamorous but it’s my reality. Hell, some weekends the entire Friday afternoon until Monday morning are a blur of my pajamas, the couch, bed and some meals with visits and snuggles with my kids thrown in. My husband is the one who shuttles the kids to the soccer games, birthday parties and religious school. I know some of you are reading this and thinking “Must be nice to have someone do it for you while you just lie in bed sleeping the weekend away…” One weekend wouldn’t be too bad, maybe two. But you don’t get to choose, and you can’t take a weekend off from being sick. You can’t choose when you stay in bed and when you get to be well. You miss the really fun stuff as well as the routine and you find yourself missing the routine things. Things like knowing the other moms in your daughter’s Girl Scout troop because you can never participate in anything because you’re sick. I’m blessed to have a wonderful village of friends who help me out when my husband can’t so Lizzy doesn’t have to miss out, but it’s not the same as having your mom there and even though my friends always make sure to take pictures of her so her moments are captured, too, what I wouldn’t give to be the one doing the capturing for once. You miss the fun things like going pumpkin picking, and routine things like Back to School Night. These are the things the healthy take for granted, complain about in the same breath that they “humble brag” about how many activities they shuttled their kids to in one weekend. These are the things the chronically ill watch from the sidelines on social media sites like Facebook and Instagram, wishing for the “normalcy” and stamina to be able to attend even one of the five events our friends have packed into the weekend. 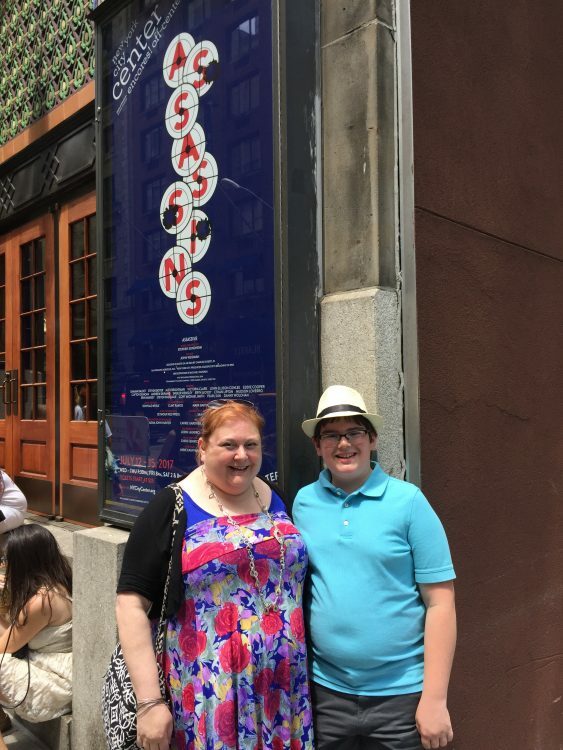 Recently, I took my son to see an off-Broadway show. It’s always a gamble buying any sort of tickets for anything in advance. For a long time we just stopped. Too much money thrown away when I was too sick to go. Then we reached a decision to stop letting fear rule our lives and illness dictate our choices. So we started planning trips and family adventures again. Always with contingency plans. I woke up feeling rotten. Not a great day. But I wasn’t giving up this chance to see a show I’ve been dying to see or this opportunity for this time with my son. Plans needed adjusting. Medications needed adjusting. You make it work and know the crash will inevitably come, and as I started to write this on the train home, my husband was preparing to catch me as I came in for landing and put me to bed. Our Saturday night plans gone, but we made the day work. It’s all about compromise. Just hang in there a little longer and you can crash. But no one would know this from the pictures posted to Facebook and Instagram – you just see me and Ryan, smiling, in the city. That brief moment captured of “normalcy” in a chaotic life of chronic illness that we live. I’ve been cautioned (and cautioned others – yes, I’m being a hypocrite here – at least I acknowledge it!) that “normal” is not a healthy word to use (in fact, I saw a great meme that said, “Normal is just a setting on the washing machine”) and I guess it’s true. For now, I’m just grateful for the days I’m able to go to the shows, the movies, the soccer games, Comic Cons and yes, even the PTA meetings. For me, they are little victories over illnesses that I refuse to let dictate my life. Perhaps the next time you see a friend with a chronic illness out enjoying life, or see their pictures online, rather than judging first, instead celebrate what a victory it is for them over their particular demon they face. I hope my friends do.